Car Fixed, But What Should I Do With This Extra Battery? The needed repair for my broken down car wasn’t as bad as I had feared. It wasn’t the alternator after all, it just needed a new battery. After a quick stop at my insurance company’s office to get reimbursed for the tow, the whole ordeal cost me $135. Which is still a sizable unexpected expense, but so much better than it could have been. My wife and I stopped at the dealership to pick up the car. We paid the bill, gathered the paperwork and were about to walk out the door when my rock star wife asked a very simple question. It occurred to me at that moment that it didn’t seem like it had been that long. Together we questioned whether that battery, which had been purchased and installed at our local Sears automotive center, was still under warranty. If that were the case, we would need the battery to collect on the warranty. At our request, the service representative made a phone call and a few minutes later a man brought us a dingy looking Die Hard battery with a broken handle. My mind raced on the way home as I thought about whether I kept the paperwork for the battery, and where it might be located. My constant need to de-clutter has caused several needed documents to be thrown out, resulting in an occasional â€œdiscussionâ€ regarding the need to organize things better. I sifted through the stack of papers sitting on the kitchen counter that we had removed from the car’s glove compartment. In a gasp of relief I found the receipt from the purchase and installation of the battery. To our surprise, it had been almost three years since we purchased the battery, but it was still under warranty for a few more months. I did take this opportunity to point out to my wife that I had successfully managed to keep the paperwork for nearly three whole years without throwing it away. She glared at me as she picked up the phone to call Sears to find out exactly what our options were with the busted battery now that we had just had it replaced by the dealership. I had read some articles about Sears being in a bit of trouble financially so I wasn’t surprised when the man my wife was talking to explained that the automotive center at the Sears in our city was closed. We would have to go to a Sears in a metropolitan area about 100 miles away to collect on the warranty. We will be traveling to that area in a few weeks anyway for a family event, so we plan to exchange our busted battery for a new one then. It’s cool and all that we get to collect on our warranty and get a new battery, but exactly what are we going to do with it? My wife wants to just keep it as a spare, but since we just had a new one put in our car at the dealership we likely won’t need to replace it for several years. We may not even keep the car that long. I suggested we put it on Craig’s list and try to sell it, but she’s not convinced. I’d probably sell it. Then you can buy a new one when the time comes. Batteries aren’t that expensive, so when you have to get a new one you won’t be hurting that bad. 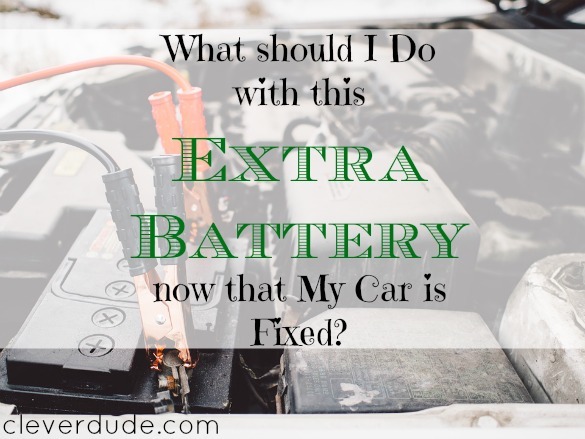 Is a new battery your only option? Would they consider giving you sears store credit for the value of the battery? I’d look for a non-profit that has vehicles or helps people in need. I’m no lawyer nor accountant, but I would think you could write off the value if you itemize. If nothing else you can have warm fuzzies because you helped someone in a bad spot. I’m pretty sure Sears batteries are prorated for the warranty so you would only probably get a small credit for the remaining months on the warranty. Not that you would do this, but when I visited my daughter in Mongolia (when she was in the Peace Corps), the Mongolian’s used car batteries to charge up their cell phones, to use their satelite TV or to light a light bulb. But they did the inventive thing, in order to “charge” the battery, they had it hooked up to a solar panel…..
@Daisy – That’s exactly what I want to do…..I think I’ve convinced the wife that there’s no upside to just having a battery sitting in our garage for an indeterminate amount of time. Thanks for sharing your thoughts! @Dan – That’s a noble thought….but I want my money out of it. LOL. @gail – that IS cool! Makes me want to do it just once just so say I’ve done it…thanks for sharing! I’d try for store credit first, sell it if that didn’t work. A battery just sitting there would be dead by the time you needed it, most likely. So selling makes more sense to me. @Jenny – yeah that’s my fear, Jenny….it’d be a waste if it just sat there and never got used. Craig’s list, here I come!